A day after Nova Scotia’s privacy commissioner pleaded for an overhaul of the government’s access and privacy laws, Stephen McNeil committed to making changes to the legislation. 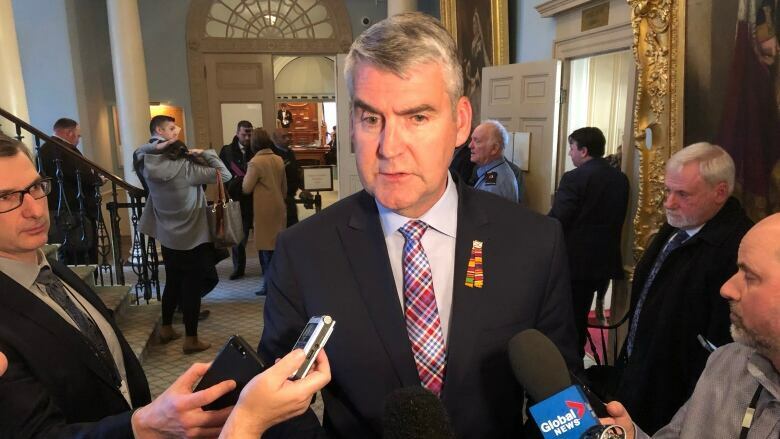 Nova Scotia Premier Stephen McNeil is committing to updating the province's access and privacy law, but said Thursday changes will not include granting the privacy commissioner order-making powers as she has repeatedly requested. McNeil's comments came a day after the commissioner, Catherine Tully, pleaded for an overhaul of the law during an appearance before the legislature's public accounts committee. Tully warned the all-party committee the current Freedom of Information and Protection of Privacy Act — last rewritten in 1993 — would not protect Nova Scotians. "I think she rightfully highlighted the changes needed since the last time this bill was updated," McNeil told reporters as the legislature reopened for the spring session. "We thought we might have it for the spring, it looks like we won't. It looks like it will be introduced in the fall." It's a marked change from comments McNeil made in January about possible amendments to the act. "There is no legislation coming this session," McNeil said at the time. "There may not be any." The premier said Thursday changes to the law will not include granting Tully order-making powers. As it stands, Tully's office can issue non-binding recommendations. "We believe the process how it's working now where she's making recommendations to government and we're accepting those recommendations is working," McNeil said. Tully has repeatedly urged McNeil to give her office more power, including in January when the Transportation Department refused to comply with her formal recommendation to reveal how much taxpayers are paying Bay Ferries to run its service between Yarmouth and Maine. At the time, Tully said the department's response was "a very good example of ... how our law is not effective." Progressive Conservative Leader Tim Houston said his party previously introduced legislation that would make Tully an officer of the legislature with order-making powers. Houston said he hoped the Liberals would consider making those changes, as well. "We'll see what they come forward with, but those [changes], in my mind, would be significant improvements to what we have at the moment," said Houston. In a 2013 election promise, McNeil said he would expand the powers of the privacy commissioner, particularly by granting her order-making power, if he became premier. Last fall, he suggested the pledge wasn't an actual election promise and that he had changed his position over the course of his mandate. Tully and Auditor General Michael Pickup released separate reports last month slamming the government for its failure to protect private information on the new online access-to-information request and disclosure system. More than 7,000 documents were downloaded on March 3, 2018, including several hundred with highly personal information, but the breach wasn't detected until a month later when a government worker inadvertently discovered the weakness in the system and alerted his boss. Tully said the privacy breaches were a "serious failure of due diligence" in the government's implementation of the website.